Writing my last foreword for the School Magazine is rather like singing "Auld Lang Syne" at the close of the year—on the one hand one is saying "Good-bye", but at the same time one is welcoming, in this case, a new decade in the School's history. First, I must say "Thank you" for the many kindnesses shown to my wife and myself during our ten years in British Guiana by Masters, boys, old boys and parents and friends of the School. British Guiana's reputation for hospitality is well known to visitors; but we were more than visitors, we came to work with you, to share your interests and to take part in your activities, and everywhere we found kindness and groodwill and we are most grateful to you all for this. At Queen's College these ten years have seen many developments, and I would like to thank the Masters in particular, and also the boys, for the very full co-operation that they gave me in the various developments that we planned and put into effect together. No Headmaster could have wished for better support. We have enjoyed our work in British Guiana and now the time has come for us to hand over our responsibilities to others. We set out to make the reputation of Queen's College and its product well known and respected throughout the Caribbean—and beyond —but it is too early yet to judge to what extent we have succeeded: in 10 or 20 years time we shall know; for our success will in the end be judged by the degree of prosperity and progress that is being made then in the independent Guyana. We have done our best—now it is up to you. God bless you and good luck. Back Row: (L to R):Messrs S.M. Insanally, R.E. Jackson, C.O. Perry, C.I. Drayton, E.A. Chang-Sang, W. King, T.C. Edwards, W. Howe. 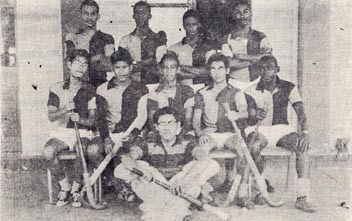 Middle Row (L to R):Messrs J.R. Rodway, Chunilall, C. Trotz, M. Delph, C.P. Yhap, B. Chinapen, E.R. Burrowes, R.L. Clarke, C.W. Yearwood. Sitting: (L to R): Mr. E.P. Clayton, Miss L. Dolphin, Messrs H.D. Boxhill, N.E. Cameron, V.J. Sanger-Davies (Principal), C.E. Barker, Miss A. Akai, Mr. Morgan. "Doing the Proper Thing at the Proper Time and Doing it Well with Pleasure"
TRIBUTE TO MR. V. J. SANGER-DAVIES M.A., T.D. Principal for the past ten years, who retires from the school in November. I was at first tempted to call this article 'the end of an era', for it is natural that when a principal leaves he carries his own peculiar atmosphere with him _ I use 'peculiar' in the sense of particular or unique. For ten years now the atmosphere of Queen's has been above all one of humanity, for the Chief has always made his boys "the real centre" of his work. Indeed no father was ever prouder than he when he could applaud the successes of "my boys" in every field. It is perhaps this obvious faith in their ability and individual interest 'n them which have imbued in Queen's the enthusiasm and spiritedness it carries into every phase of its activity. And, under his leadership, Queen's has enlarged its activity to a great extent. Academically the Chief has been responsible for the expansion into three parallel forms right through the school, and it was his idea that after the Thirds we should have the Classical Modern and General streams. Under this system we have seen improvement not only in the number of boys who perform creditably in the Classical and Modern streams, but there has also been a marked improvement in the work of the General boys, those who before were seldom expected to achieve more than two passes. Through this system a way has been found to increase the number of 'bright' boys from one-half to two-thirds the total, and the work of the other third has also benefited considerably. Hand in hand with these innovations came the introduction of the 'Remove forms and Evening Classes. Both of these successful ventures were a boon to those who wished to pursue courses in Natural Science but were without facilities for doing so. This was a direct attempt to supply the country's ever-increasing demand for more scientists. Yet, despite the Inter-House Work Competition and every incentive to the boys as far as their work was concerned, time and again the Principal has warned them not to ' let your work interfere with your education". For he has been at all times concerned with creating "a way of life" for the members of the school". In 1953 he told parents on Speech Day that academic training alone was not sufficient, for the school was training their sons for citizenship. Indeed this is perhaps the key to the 'peculiar' atmosphere of Queen's under its present principal, for he has always encouraged boys to do things outside the classroom. The finest testimony to this are perhaps the seventeen clubs and societies which exist in the school today. This was the Principal whose dictum was "a headmaster must always be right". It was impossible to win an argument with him, and the luckless fellow up for a caning who protested "but I didn't do anything" was crushingly told, "That's just it. You never do". Yet the boys have always known him as a firm friend who could be trusted to give sound advice and defend them from any external attack. "Doing the proper thing at the proper time and doing it well with pleasure" can truly describe the gusto with which the Chief would wield his mighty pen in defence or his mightier cane in offence. He has truly given us many 'peculiar' memories. For those who would like to read his early statements and share in his ambitions through the years, here are some excerpts from his addresses to the school. December 1952—: "Will you give a gift to the school this Christmas? — a simple gife ... A simple gift I say but one that money cannot buy . . . love, loyalty and devotion .... That is what I mean to give to the school this Christmas. Will you do so too? "It is my hope that when I say Queen's College, it will be known that I mean Queen's College, British Guiana the world over". 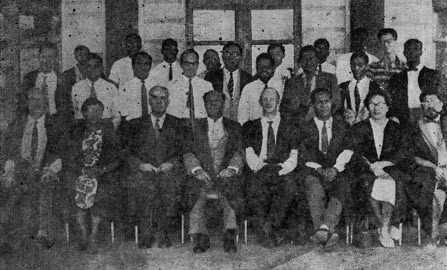 Easter Term 1954: "British Guiana requires men of stature: men having wisdom and faith: men who are not afraid to speak their minds and to stand by their decisions: men who are understanding, sympathetic and unselfish. This school exists to supply that need". "He who cannot find something here to which to give his whole heart can have no heart to give". Speech Day 1954: "It is quite clear that no one will make a real success of his work—or his games—unless he is happy working at them, for it is ultimately in enthusiasm and in hard work that complete happiness is to be found." Magazine Foreword 1953-54: "Our sons must be loyal, having a full understanding of all that implies. They must have faith, wise judgment and skill; bold- ness and determination: sympathy and understanding: but above all they must have integrity, such as will command respect and trust from friend and foe alike." Goodbye: A firm handshake from our Principal at the farewell ceremony for Mr. N.E. Cameron, while Hon. C.V. Nunes looks on approvingly. This year our magazine would like to pay tribute to our retiring deputy principal, Mr. N. E. Cameron. This distinguished son of Guiana and Queen's has had an outstanding career, one that should serve as trail blazer to the Guianese youths now about to enter into another era of their country's history. Mr. Cameron started his brilliant career in 1916 winning the Government Junior Scholarship, placing 1st in the West Indies. He was a Perceval Exhibition winner with a record of 5 distinctions. In 1921 he won the Guiana Scholarship, topping the list in both British Guiana and Barbados with a percentage record in maths. Mr. Cameron continued his career at Prince William Hall Cambridge. In 1921 he obtained 1st class honours part 1 in Maths. Tripos and was a prize winner. 1925 he was Senior Optime and in 1929 he obtained his M.A. degree. From 1926-1934 Mr. Cameron was the Principal of the Guianese Academy of which he was the founder. Among his students are such famous present day Guianese as the Chief Justice Mr. J. A. Luckhoo; the Mayor—Mr. Merriman; the Chief Education Officer Mr. F. Case; and the Registrar of Supreme Court Mr. R. S. Persaud. In 1934 he joined Q.C. as an assistant Master in Maths., Latin, French. He was later appointed Senior Master, and in 1959 became Deputy Principal. Mr. Cameron is an acting examiner on the Teachers Certificate examination and also chairman of the Board of Examiners for Land Surveyors. Mr. Cameron has not only distinguished himself academically, but has also given loyal and devoted service to Queen's and the community in general. During the war he was Sergeant of the Fire Protection Brigade at Q.C. A table tennis enthusiast, he took teams of table tennis players to compete against the American Army, Navy and Air Force personnel stationed here during the war. In table tennis circles he is remembered as the man who introduced the chop stroke to the colony, and who coached L. F. Drayton the first colony champ. He also coached the team that won the White Cup inter-club Table Tennis tournament. Mr. Cameron's contribution to Queen's can only be briefly touched upon. He has written the only published history of Queen's College. During his association with the school he was instrumental in gathering a gift of books from USIS in Social Sciences and Maths. He also presented the library with a complete set of the works of Anatole France and was responsible for the putting up in the staff-room of a set of University crests of the masters teaching at the school. He founded the Association of Masters and Mistresses and the Bishop's High School Parent-Teachers Association of which he is now honory life-member. For years he was one of the pillars of the Old Boys Association which was instrumental in the building of the present QC. He is now senior vice-president of the Association. The community is also indebted to Mr. Cameron for his pioneer work in cultural activities. He was the founder-president of the Union of Cultural Clubs largely the forerunner of the present Arts and Culture Committee of which he is now Vice-chairman. He was associated with a large number of clubs, holding office in every department. He was President of the RACS and is at present chairman of the Museum and Zoo Committee. Mr. Cameron has also lectured on various sociological topics. His enthusiasm for the building of a cultural foundation for the Guianese nation has led him to organise concrete, exhibitions and other cultural activities to achieve this end. The author of several works, (his collection of plays "Three Immortals" was presented to the Queen in 1953), Mr. Cameron was also the director and -producer of a number of plays largely on historical and sociological themes. He has also written four text-books on Mathematics, and since 1931 he has been advocating the use of locally produced text-books in our schools. In June this year Mr. Cameron was awarded the MBE "for more than 35 years loyal and devoted service to the community in general and to Queen's College in particular and for distinguished services to Education in British Guiana". No greater tribute than this can be paid by this magazine, on behalf of the boys, to a man who as master, house-master and deputy-principal has given such loyal and enthusiastic service to the boys of Queen's. This was indeed a son of whom Guiana can be truly proud. Back Row: (L to R): C.O. Marshall, F.L. Douglas, W. Fraley, B. Dummett, H.B. Sheppard, E.M. Griffith, S.A. Ridley. 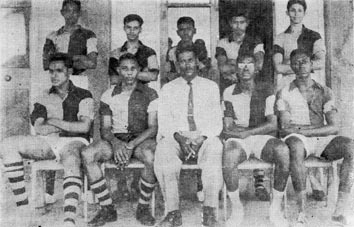 Middle Row (L to R): J.P. Benjamin, K. Nobrega, M.G. Browman, R.I. Zitman, W.G. Ho, W.C. Klass, P.A. Griffith, S.A. Hinds, A.R. Morrison, N.D. Williams. Sitting: (L to R): D.B. Ying, D.B. Farnum,?? ?, A.R. Bacchus (Head of School), Mr. V.J. Sanger-Davies (Principal), L.S. Birkett (Dep. Head of School), R. Roopnarine, E.I.J. Fields. BACCHUS, A. R. (1954-1962) — 1954 — Government County Scholarship; 1959 — GCE. Ordinary Level; 1960—Senior; School Cadet; School Prefect; Advanced Level; 1961—Head of school; Head of Nobbs house; school colours. BENJAMIN, J. P. (1955-62)—1953 — Government County Scholarship- I960 — GCE Ordinary Level; 1959 — Vice-President of Historical society; 1960 — Editor of QC Magazine; 1960—President of Dramatic Society; Secretary of Chess Club; 1961—School Prefect; Advanced Level. BIRKETT, L. S. (1953-62)—1958—QC Middle School Exhibition; 1960—GCE Ordinary Level; School Prefect; 1961—Deputy Head of School; Head of D'Urban House; School Colours; Advanced Level. CAMPBELL, G. H. (1954-62)—1954 — Government County Scholar; 1959— QC Senior Scholar; GCE Ordinary Level; 1960—Advanced Level—Distinction in Latin, French, Spanish; 1961—Guiana Scholar; School Prefect; Head of Austin House; School Colours. 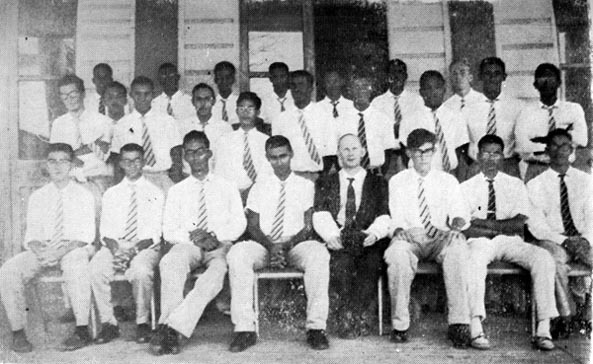 GRIFFITH, E. M. (1954-62) 1960—GCE "0" level; 1961—President of Science Society; School Prefect; Head of Woolley House; Vice-Captain football -- School Colours; Advanced Level. HINDS, S. A. (1955-62); 1955—Government County Scholarship; 1959 — "O" level; 1960—"A" level (distinction in Pure and Applied Maths); 1961_L/cpt. in Cadet Corps; School Prefect; Head of Raleigh House; Advanced Level. 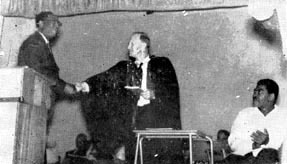 HO, W. G. (1954-62); 1954—-Government County Scholarship; 1959_"O" level, QC Senior Scholar: Editor of Lictor; 1960 — School Prefect: President of Science Society; 1961—Head of Pilgrim house; Advanced Level. 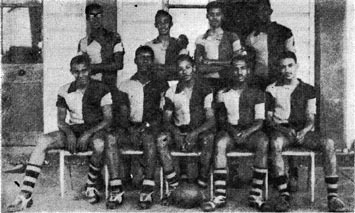 KLASS, W. C. (1954-62); 1954—Government County Scholarship- 1959 — "O" level 1960—School Prefect; 1961—Scholarship to UWI. Deputy Head of D'Urban house. NOBREGA, K. (1952-62); QC Junior scholar; 1958-QC Middle School scholar; 1959 — '0" level; 1961 — School Prefect; Advanced Level. I860—Treasurer of Lictor. 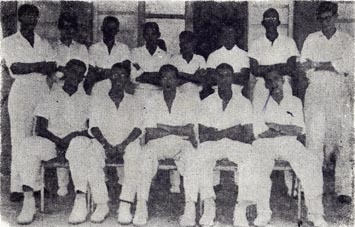 ROOPNARINE, R. (1954-62); 1954—Government County Scholarship; 1959—"O" level- 1960_"A" level (distinction, in French); School Prefect; Captain of Cricket; school colours; 1961—Head of Moulder House; captain of cricket. TE1XEIRA, F. (1955-62); —Government County Scholarship; 1960—"O" Level; 1961_School Prefect; Head of Weston House; Advanced Level. WILLIAMS, N. D. (1953-62); 1960—"0" level; 1960—Secretary of Dramatic Society; Secretary of Debating Society; 1961—Scholar Prefect; Deputy head of Woolley House. ZITMAN R. I. G. (1954-62)—1957—Middle school scholarship; 1959—"O" level; Secretary of Table Tennis; QC Senior Scholar; 1960—School prefect; Head of Cunningham House; Vice-Captain Table Tennis; 1961—Head of Cunningham House; Captain of Table Tennis. Back Row: (L to R): R.M. Stephen, H. Ross, J. Babb, P.E. McLean, C.W. London, C.L.Y. Walcott, J.O. Smith, L.S. Birkett. Front Row (L to R): A.R. Morrison, H.E. Dolphin, R.R. Roopnarine (capt. ), P.A.M. Griffith (vice capt. ), G.P. Murray. Standing: (L to R): R. Dummett, E.P.S. Byrne, L. Joseph, B. Charles. Sitting (L to R): M.G. Browman, E.M. Griffith (vice capt. ), Sheppard (capt), G.K. Lewis, D.A. Chung. Absent: M.E.M. Davis, and A.E. Vargas. Back Row Standing: (L to R):D.A. Chung, P.A.M. Griffith, D.A. Morrison, C.B. Adams. Middle Row Sitting (L to R): W.G. Ho, C. Holder, E.P.S. Byrne, C.V. Ho, U. McRae. Front:: T.A. Sue-A-Quan (goal keeper). Back Row Standing: (L to R): P. haynes, W. Hubbard, C.W. London, AE. Azeez, A.M. Gajraj. Front Row (L to R): V. Edwards, M.G. Browman, Mr. McDonald, J.O. Smith, D.T. Roberts.